We go to Vegas often with our kids, and we have learned a TON over the years about doing Vegas with kids the right way. 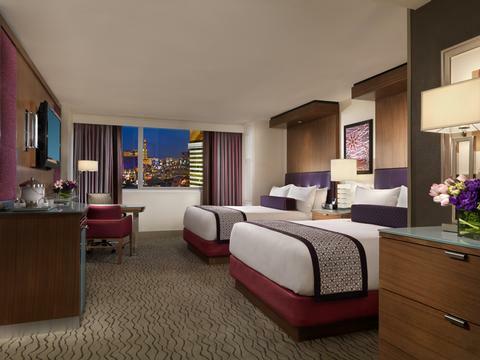 If you have never been to Vegas, I will warn you that there are so many choices when it comes to hotels that it is really hard to know which one to pick, especially because every family is different and has very specific needs and desires. And that is where expertise really comes in handy. That is why I wrote this article, to help families like yours find the Best hotel in Las Vegas for YOUR family. I will show you where to stay in Las Vegas with kids (hint: it’s all about the “strip”), where to find the best family pools in Las Vegas, which hotels have large family suites, which hotels have the best Vegas shows for kids, and a list of family restaurants and activities at each hotel – basically everything you need to plan a fabulous Las Vegas family vacation. You know, there is a common misconception about Vegas, perhaps due to its nightlife image and seedy history, but I will tell you the truth – the idea that Vegas isn’t family friendly couldn’t be further from the truth. As far back as I can remember my parents took me as a little girl to Las Vegas every single year, usually at my request for my birthday. I loved Vegas as a ten year old, I rocked Vegas while pregnant, and I have been taking my own kids to Vegas almost every year since they were born. The Vegas tradition lives on in this family. I like to be helpful, and some people just prefer maps. 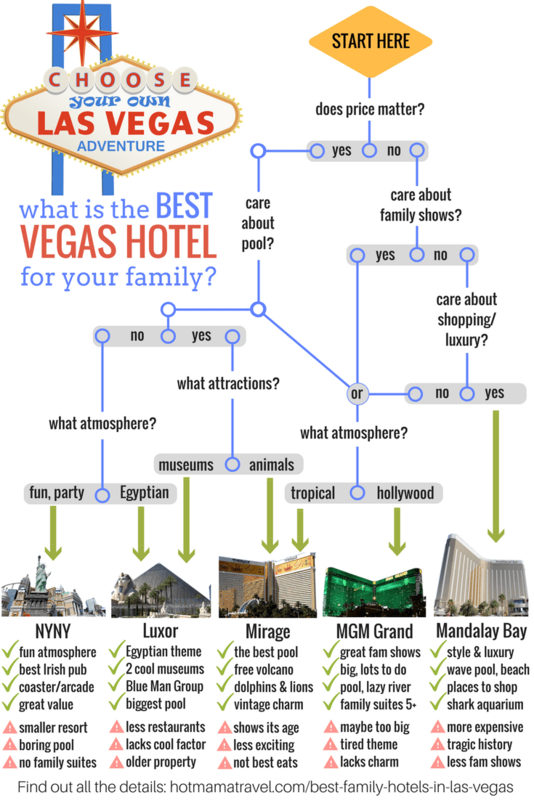 So I also created this handy Las Vegas hotel map that you can share with friends and family and use when planning your next visit to Vegas with kids. 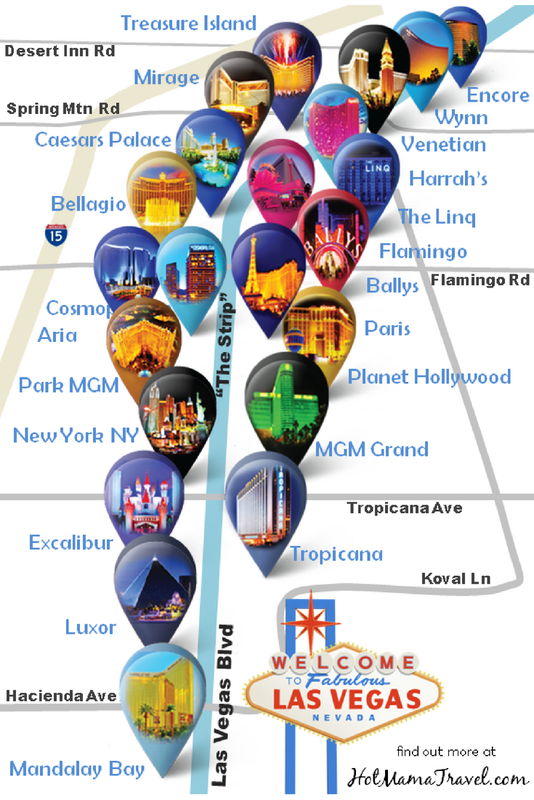 You can click on the bubble icons on the map to see more pictures, read reviews, and check rates and availability on Vegas.com. The best family pool in Vegas! There are lots of hotels in Vegas with awesome pools, but there is just something special about the Mirage pool with its cascading waterfalls, palm trees galore and the way it winds and curves throughout the lush gardens. Vegas hotels pepper the Strip and tower the sky everywhere, but somehow the large buildings seem to fade away and it is easy to feel you have escaped to a tropical oasis at the Mirage pool. It’s a little outdated. This is actually not a problem for us because we have been going to Mirage since the 90’s and it feels comfortable and vintage for us. But there have been some outrageous new Vegas resorts that have popped up on the scene over the last 15 years like Bellagio, Wynn, Aria and Venetian, that have a more modern atmosphere and appeal. Lacks a shopping mall. If your family likes shopping, there are other family friendly hotels on the Vegas strip that offer a brilliant indoor shopping experience like Paris, Venetian and Mandalay Bay. Mirage – not so much. However, Mirage is right next door to the Forum Shops at Caesar’s Palace, and this should be more than enough to quench your shopping thirst. The Mirage pool is my favorite. Like literally one of my favorite places. When I dream of Vegas, I dream foremost of the Mirage pool. The Mirage pool is practically designed with families in mind. There is one large interconnected pool that twists and curves throughout the property, with a new waterfall or grotto around every corner. 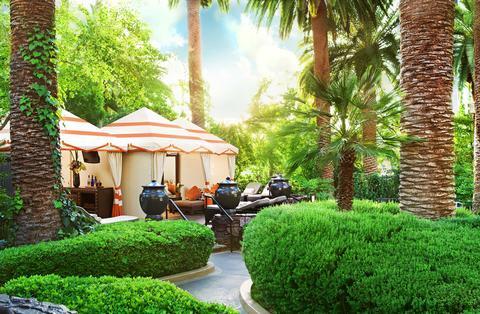 There are two hot tubs surrounded by lush greenery that will make you feel transported. 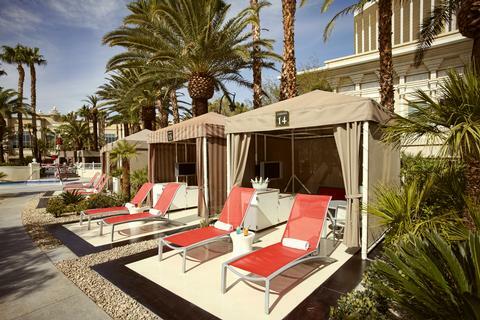 You can rent a cabana, or you can get up early and reserve some free lounge chairs by the pool. You can also have a poolside lunch under water-misters at Paradise Cafe, or grab a beer or cocktail the Dolphin bar near the center of the pool area. They used to have a water slide that the kids loved, but that has unfortunately closed. Still, there is a lot to love for families at Mirage pool. There are quite a few restaurants to choose from at Mirage, and I consider just about all of them kid-friendly. Here are some of my favorites. Cravings Buffet: This is one of my favorite buffet restaurants in Vegas and it will have something special for everybody in your party. I like that you can pay a reasonable fee for bottomless champagne and beer. Carnegie Delicatessen: The sandwiches here are huge and the food is reminiscent of some of the best New York delis. Do me a favor and don’t leave without trying their Matzo Ball soup. This was our go-to restaurant when my kids were toddlers because I could still remember them in diapers chowing down on Matzo Ball soup and noodles. Pantry: This restaurant replaced the old time Caribe Cafe and recently replaced BB Kings near the lobby elevators and gift shop area. While we miss Caribe and live music at BB Kings, we do really love the clean at-home atmosphere of Pantry Restaurant. This place serves home style American classics like chicken and waffles and biscuits and gravy, and will serve you breakfast 24 hours a day. California Pizza Kitchen: CPK is as family friendly as it gets in Las Vegas, with unique chopped salads and pizzas in a no-frills atmosphere. Located right next to the sports book, California Pizza Kitchen has been a fixture in the Mirage for years. Who doesn’t like pizza, after all!? There are a couple fun places to grab a cold one at Mirage that will also let you bring your munchkins along for the ride. LVB Burgers and Bar: This place seriously has one of the best burgers I have ever tasted. But what is awesome if you have kids with you is that they have an array of mind-blowing milkshakes, and even some adult-friendly spiked milkshakes (if you know what I mean). You can pull up a chair at the bar and enjoy a cold beer while watching them cook your burger in the center of the restaurant, for a very cool experience. The Still: The Still is a retro-themed sports bar with 27 large TVs that specializes in craft beer and unique cocktails. You can grab some tacos or a quick bite, and the kids will enjoy that there are fun activities like shuffleboard available. At the center of it all is a refurbished Airstream trailer that serves as full functioning kitchen. Dolphin Bar: The poolside Dolphin Bar is a great place to take a break and grab a drink while you are out playing with your kids in the Mirage Pool. Lots of frozen concoctions like margaritas, strawberry daiquiris and my favorite, the pina colada with a generous slide of pineapple garnish. 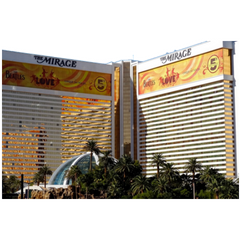 Mirage may not be the flashiest Vegas resort anymore, but it is still a family favorite and one of the best Vegas hotels for kids. 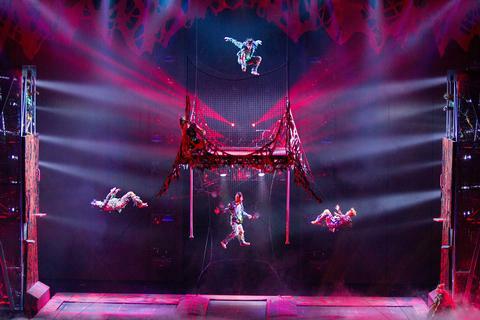 With wonderful kid-friendly Vegas shows, family friendly restaurants and one of the best pools in Vegas for families, there is no way you will leave this place after a visit with your kids without wanting to book the next trip. Great pools! The MGM has one of the best family pools in Vegas, with a Grand Pool Complex that includes 5 different swimming pools, pristine waterfalls, rock-cave grottos, and a huge lazy river that extends 1,000 ft. 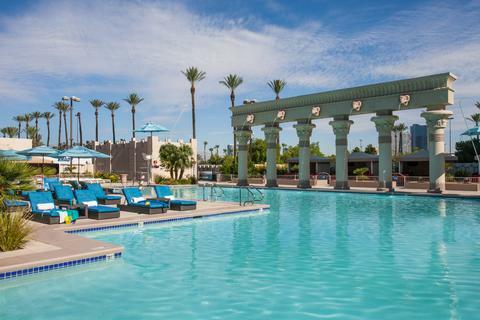 In our opinion, it is right up there as one of the best pools for kids in Vegas alongside the Mirage and Mandalay Bay. 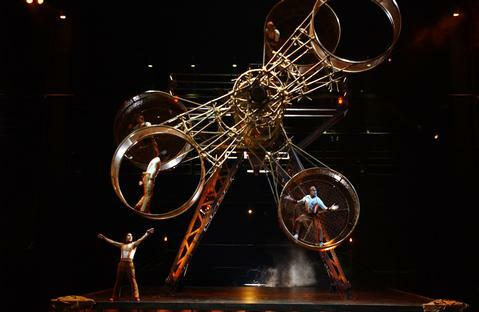 The best lineup of family-friendly shows in Vegas! 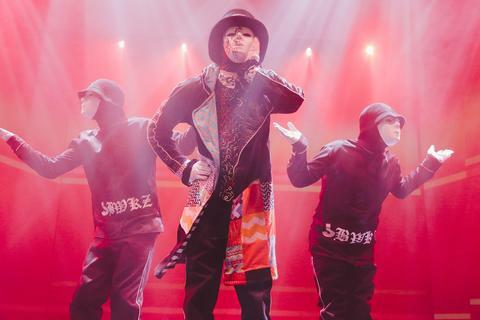 Children (5 or older) are also welcome to some amazing nightly shows for families, including the magic of David Copperfield, the heart-thumping KA Cirque Du Soleil show, and the thrilling Jabbawockeez dance show, which was voted as the Best Family Show in Vegas and the “Best All Ages Show” three years in a row. It’s like, really big. 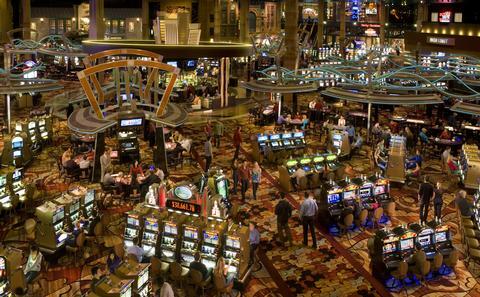 MGM Grand an extremely large complex – so large that it is easy to feel constantly lost on the Casino floor. In this way, the hotel also lacks the intimacy of smaller family hotels in Vegas like New York. Indoor atmosphere lacks romance. MGM also lacks a romantic indoor shopping area like the amazing cobblestone streets of Paris and the beautiful winding canals of the Venetian. It lacks the European charm and tropical allure of other hotels on this list. The aforementioned Grand Pool is a sprawling complex that is a big plus for families visiting Las Vegas. 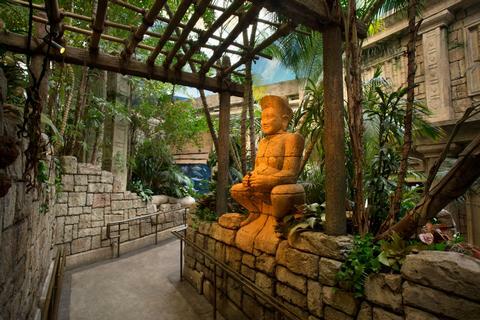 There are 5 pools with lots of waterfalls and even a few grottos to help you escape the hubbub. You can rent cabanas or get a comfortable daybed for the day, or you can choose a totally different adventure rent a tube to float along the lazy river all day. If you get hungry from spending all day in the sun, you can have lunch at Cabanas Grill Restaurant, or you can grab a beer, cocktail or refreshment at one of the 5 different bars within the Grand Pool Complex. There are literally tons of restaurants to choose from at MGM, and here is a list of some of my favorites that the kids will probably like also. 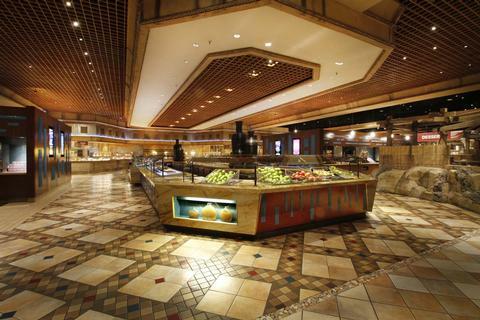 MGM Buffet: The safe choice – everybody will find something to love at this buffet open for breakfast, lunch and dinner. Avenue Café: This place is pretty cool with a retro design that serves hearty meals for breakfast or lunch. Food Court: You likely won’t find me at the food court, but it is a place to grab a quick bite if the kids are getting hangry. It is open all day long. Emeril’s New Orleans Fish House: Everyone knows Emeril is the man, and this is a great place for comfort soul food inspired by traditions of New Orleans and the American South. Emeril’s Creole kitchen is open every day from 11:30am to 10pm. Fiamma Italian Kitchen: The is a business casual restaurant with comfortable leather seats and a fireplace, but you can totally get away with bringing your kids here for some authentic Italian cuisine, open nightly for dinner at 5pm. Kids are no excuse not to take care of yourself – and they should certainly never hold you back from enjoying a cold one when you are in Vegas. My kids are used to our routine and I think they have come to enjoy hanging out with us in loud sports bars, pubs with live music, and cantinas with killer margaritas. Luckily there are several great options at MGM. Michael Mina Pub 1842: Now this is what I’m talking about! I love pubs and I loved how welcoming pubs were in Scotland for children when we visited a few years ago. Pub food is never something to write home about, but this place is different. Chef Mina takes comfort pub food to a whole new level. There are lots of beers on tap and unique whiskeys to sample from here, too. 1842 is the year Pilsner beer was invented, hence the name. Open Thursday to Monday from 11:30am to 10pm. Tap Sports Bar: I see most sports bars as being kid-friendly, and this is a cool place with lots of TVs (60 to be exact), lots of different beers on tap, and an eclectic collection of sports memorabilia. Sports lovers will feel at home here and the kids should enjoy the atmosphere just fine while you savor a cold one. Tap is open every day of the week from 11am to 11pm and opens a few hours earlier at 9am on Sundays. 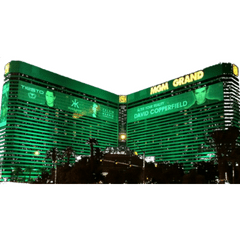 MGM offers a grand experience, no pun intended, with a truly eclectic mix of restaurants and shows and a family-friendly, if not awe-inspiring, atmosphere. It lacks the intimacy of Luxor and NYNY, and falls short of the charm of hotels like the Venetian, Mirage and Mandalay Bay. 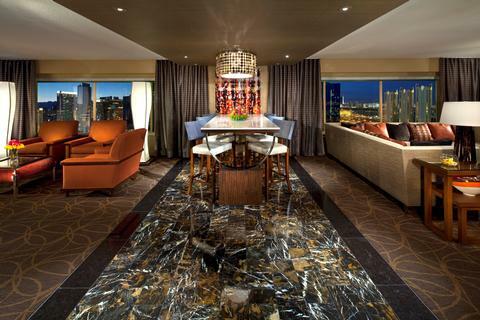 However, I know for sure that you will have an amazing, well-rounded Vegas experience with your family at the MGM Grand. It’s fancy, but at a reasonable rate. 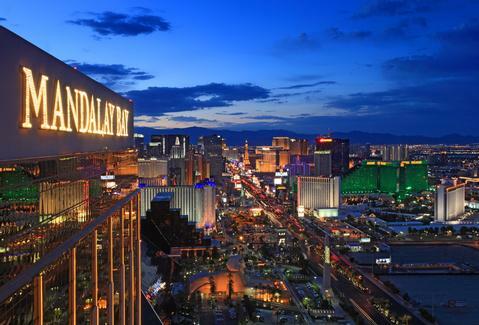 The Mandalay Bay is the most luxurious hotel on our list of the top 5 family hotels in Las Vegas, but it is also a part of the family of MGM Resorts and it is possible to find some great deals online or by using your M Life card. The. Shark. Reef. Aquarium. Enough said. 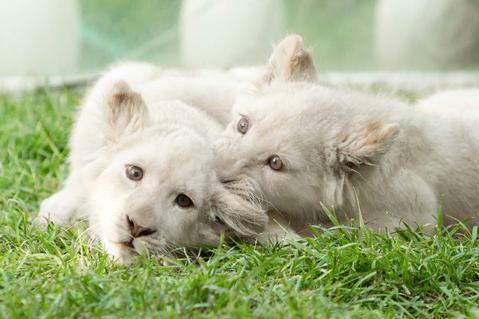 The whole family will delight over 2,000 different animals including sharks, sea turtles, rays, pirhanas, jellyfish and rare golden crocodiles. You can even interact by feeding sea turtles, sharks and stingrays. 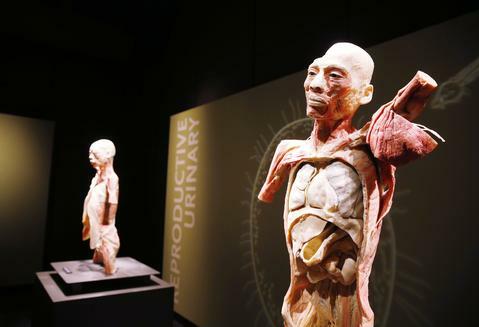 A beautiful, educational, and awe-inspiring way to spend the afternoon at Mandalay. It’s further from main action on the Strip. 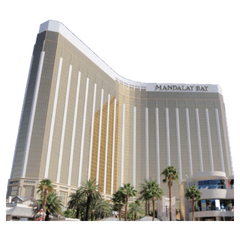 Since Mandalay Bay is on the southern end of the Vegas strip, you will not be able to just leave your hotel lobby and start walking along the Strip. You will first have to take the free Mandalay tram to Excalibur and then start your Strip journey walking north from there. It is a minor inconvenience if walking the strip is like your favorite thing. 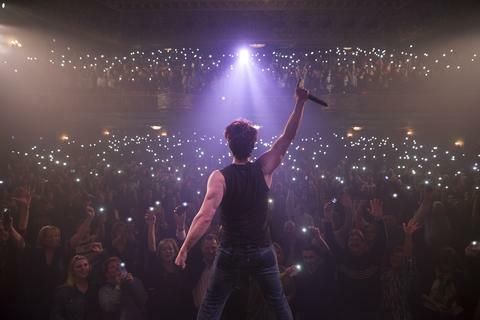 Less family friendly Vegas shows. 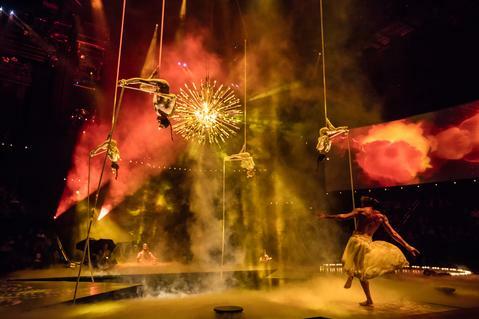 While Mandalay Bay does have its own Cirque Du Soleil show, Michael Jackson ONE, which allows children ages 5 and up, it lacks the breadth of great shows like the magic and comedy acts offered at other family-friendly Vegas resorts like Mirage, MGM and Luxor. The pool at Mandalay is much more than a pool, and that is why they call it Mandalay Bay Beach. This is always rated as one of the top pools in Vegas overall and is definitely one of the best Vegas pools for families, too. For one it has the lazy river, which is popular with kids and adults because – well who doesn’t like to float calmly through a lush tropical landscape? But the thing that really sets the Mandalay Bay pool apart is that it has over 2.5 thousand tons of real sand, making you think for a moment that you are on a real beach in the South Pacific. Another unique feature is the huge wave pool that produces pretty nice-sized swells that are kid-friendly but still loads of fun. Of course, you will also be able to rent inter-tubes, day beds, cabanas and even a bungalow for the family. If you book between May and September, you might also be able to catch a concert at the Mandalay Bay Beach with the Beach Concert Series. 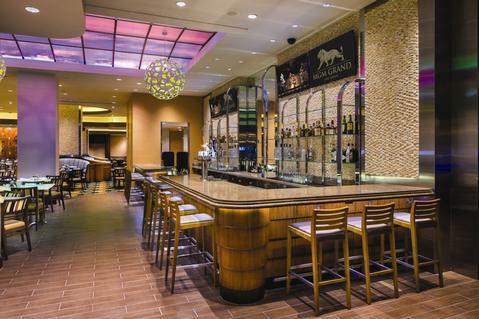 The Mandalay Bay is a huge property with 24 different restaurants and lots of fun places to grab a drink with kids. You can find something for every taste or craving in your family. House of Blues: The House of Blues restaurant and bar is a great kid-friendly restaurant in Vegas to enjoy southern comfort food while listening to authentic musical talents in blues and rock n roll. We went here for an early lunch one day and ended up loving the music and experience so much that we stayed until dinner time! This is a great place to catch live music in an atmosphere that is super family friendly with pretty good food to boot. 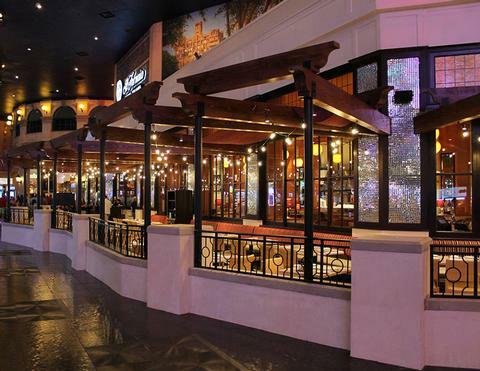 Border Grill: Border Grill is located next to the lazy river at Mandalay Bay Beach, and it is a great place to eat Mexican food al fresco on the fun outdoor patio overlooking the beach area. This is a great place to grab brunch and a bloody mary or margarita. 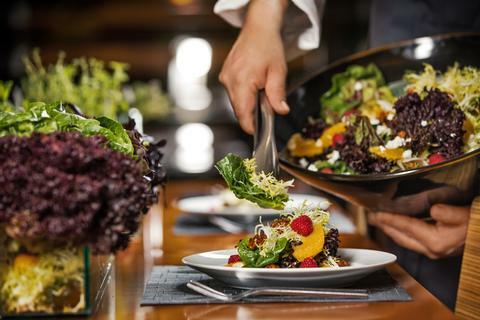 Citizens Kitchen & Bar: Comfort food – soups, salads, sandwiches, omelettes – this is a great atmosphere to grab lunch or brunch, and with the lively music, it is quite family friendly. On another plus side, they have lots of craft beers to choose from. We will grab a drink with kids just about anywhere that serves cold beer and classic cocktails. 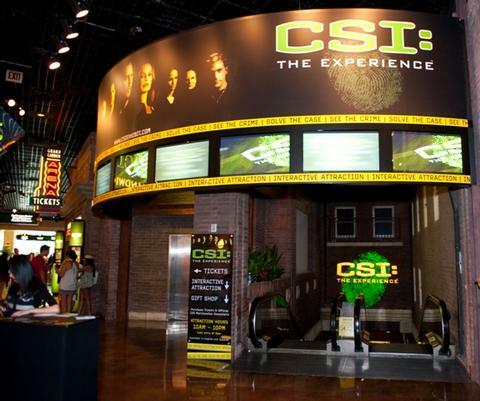 There are a couple places at Mandalay Bay that are perfect for having fun with kids in Vegas. House of Blues Restaurant and Bar: Again, this is a great place to grab a drink and listen to free live music in Vegas with kids. Ri Ra Irish Pub: We love a good Irish pub with live music. Our kids are usually happy with fish and chips, and we can drink Guinness all day long! Ri Ra has classic Irish pub fare that is much better than you’d expect, and live music every day of the week. You can get breakfast, lunch or dinner at Ri Ra. When we stay at Mandalay Bay, if we are not at the beach, you will likely find us at Ri Ra Irish Pub. 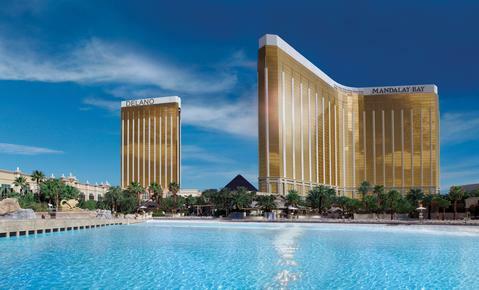 Mandalay Bay is the most luxurious among the best family hotels in Vegas, with beautiful chic rooms, a modern tropical atmosphere, and an amazing pool that is actually more of a beach with a wave pool and lazy river. Kids will love the Shark Reef Aquarium and your family will definitely have fun listening to live music at House of Blues and Ri Ra Irish Pub. 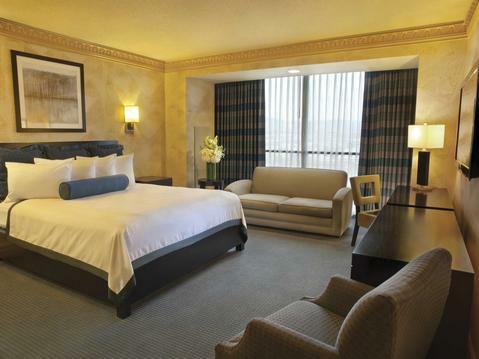 It is also just a quick free tram ride away from other family friendly Vegas hotels like Luxor and New York New York. Great value. 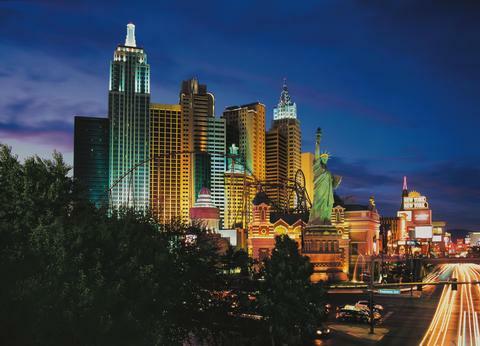 The NYNY hotel has consistently lower rates than the other kid-friendly Vegas hotels on our list, except for the nearby Luxor hotel, which also has comparable rates. With a few more amenities geared toward children and the fact that NYNY has the Nine Fine Irishmen Pub, this should easily be the go-to budget hotel for families in Las Vegas. The best Irish Pub. Did I mention we love Irish Music and Irish beer!? We are not huge fans of Irish food, but the Colcannon Soup, and the Fish and Chips at Nine Fine Irishmen are so good that it totally changed our minds on that. 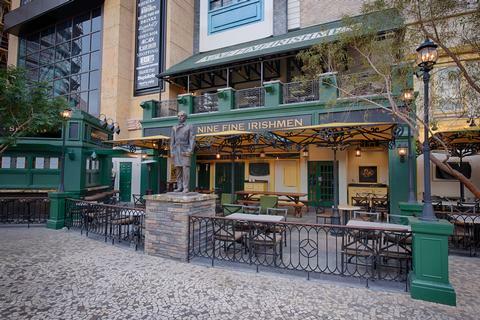 Seriously, nothing beats a long day in Vegas like spending an hour or two sipping pints of Guinness on the warm patio of Nine Fine Irishmen. Kids are allowed in the restaurant and on the patio until about 9 or 10pm. It’s a non-stop party. We gave the award for the most exciting Vegas hotel for families to NYNY, and for good reason. The atmosphere here is constantly a fun party, whether it is the live dueling pianos and jubilant crowd at the Times Bar in the middle of the casino floor, or the family friendly Irish music pumping out from Nine Fine Irishmen, or the non-stop screams of roller coaster riders. If you are not in Vegas to let loose and have some fun, and you would prefer a more quiet and contemplative experience, than NYNY is not your place. Less accommodating for larger families. NYNY has nice rooms, don’t get me wrong, but they seem to lack the luxury and the range of choices available at other family resorts in Vegas. For example, I don’t think they have any rooms designed to accommodate more than 5 guests. The Pool at NYNY will get the job done, but it is not one of the top Vegas pools for families. The do have a bar and drink service, and you can rent a cabana for the day, but there is no restaurant to eat poolside and it really seems like the pool was an obligatory afterthought in the design of NYNY, which is totally fine for trips we take in the winter when we don’t plan to use the pool anyways. 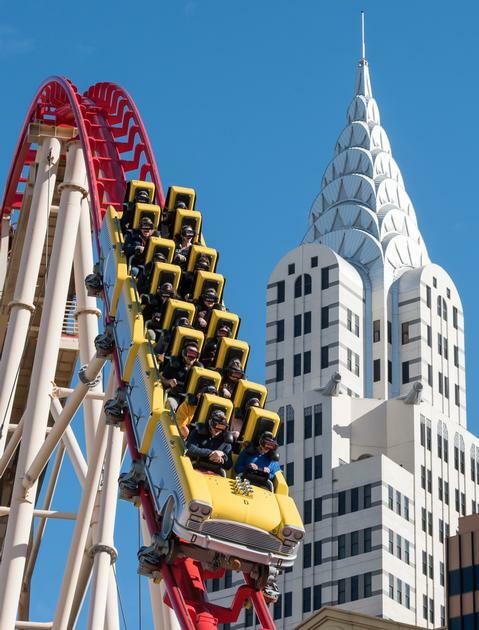 The Big Apple Roller Coaster: This roller coaster is pure fun and excitement for the kids, and adults will also enjoy zipping around the New York styled Hotel with views of the Vegas Strip. With a $26.00 scream pass, your kids can ride all day as much as their hearts desire. Not bad! For tech savvy kids and families, NYNY also just introduced a Virtual Reality version of the coaster ride in which you wear VR goggles on the actual roller coaster and get a whole new crazy experience in a virtual world synced to the twists and turns of the actual coaster. I haven’t tried it yet, but it sounds futuristic and I bet lots of people will find it unique and thrilling. The Big Apple Arcade: The arcade at NYNY is on the second floor just off the lobby, and it is HUGE. Kids love arcades, what else needs to be said. Hershey’s Chocolate World: If you have a family member that just LOVES Hershey’s chocolate, then this place is a must see. 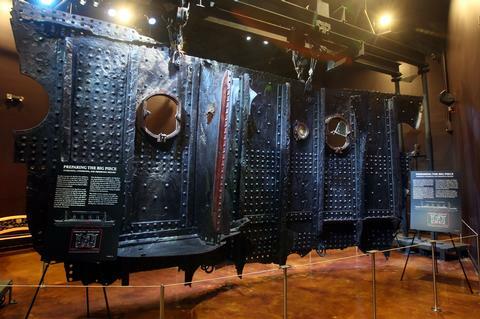 Chocolate World is a two-story shop that features everything Hershey’s, including an interactive retail experience where you can make the unique Hershey treat of your dreams. It is a fun free activity, even if you just want to snap some unique pictures with a giant Hershey kiss. The Park: The Park is located in a beautiful tree-filled space between NYNY and Monte Carlo and stretches all the way back to the T Mobile Arena. There is a 40 foot statue, park benches and design features reminiscent of Central Park in New York. There are a host of kid friendly restaurants serving killer food and drink all along the park, so you feel completely transported to the Big Apple. There are lots of affordable family friendly Vegas restaurants at NYNY Hotel. While I appreciate that Vegas is a place for celebrity chef restaurants, we are not the type of family to eat at these expensive, fancy restaurants. This actually makes the dining options at NYNY perfect for families like ours. Tom’s Urban: Casual American dining in an eclectic modern space that has huge family friendly circular booths, Tom’s Urban is a mesh of American classics and world inspired street food. They have creative craft cocktails and craft beers galore. Open for breakfast, lunch or dinner from 7am to 2am daily. Il Fornaio: Amazing Italian Cuisine at a family friendly price point, we eat at Il Fornaio at least once every time we stay at NYNY. Lovely warm bread is served before the meal, and the pizzas and pastas are all fantastic. A great selection of wines too, this place has a nice ambiance located right along the casino floor in the heart of all the action. It is open for breakfast, lunch and dinner, as well. America: This is a classic Vegas cafe and the perfect place to get eggs, hash browns and a black cup of Joe in the morning. America has rustic American road trip vibe to it and is cost friendly. They have really good bloody marys to boot! America is open 24 hours a day, every day, ya’ll. Sake Rok: A great place to grab some fresh sushi and sake. Yes please! Bruxie: The place for delicious sandwiches made out of waffles. You heard that right! Try the famous Original Chicken and Waffle Sandwich and it will probably change your life. Beerhaus: Designed after classic beer halls, Beerhaus has a creative menu that will satisfy craft beer connoisseurs and casual drinkers alike, with a range of sausages and sandwiches to pair with delicious beers in an outdoor patio environment. Best of all, they have a daily happy hour from 2-6pm with $4 pints and other specials! Count us in. My kids know when we stay at NYNY, we will spend a couple hours each night at Nine Fine Irishmen. The pool is the reason we keep going to back to Mirage in the Summer, and the pub is why we keep returning to NYNY in the off season. Even when we stay somewhere else, we always find an evening to take a cab or uber over to NYNY to grab a pint of Guinness and listen to one of our favorite free live music bands on the Vegas Strip, Sin e Ri Ra. Nine Fine Irishmen: It is so funny that this place is always crowded with visitors speaking in Irish accents. Like families actually travel from Ireland to Vegas and then plant themselves, of all places, in an Irish Pub. That is such an Irish thing to do (and I love it)! And I can’t blame them. Love everything about this place for over a decade. Open until 11pm Monday through Friday, the live music starts at 9pm but I recommend getting there a wee bit early to reserve a spot. Gonzalez y Gonzalez Grill: If you love Mexican food and margaritas, then this is a fun place to check out for a couple hours. Not the best Mexican food, but it has a fun atmosphere and is a kid-friendly place to grab a serious cocktail. Village Street Eateries: On more than one occasion we have had a “second” nightcap at the Street eateries near the Times Square Bar in NYNY. What does this mean? Well the kids are sometimes hungry, bordering on hangry, after spending the evening at the Irish Pub, and it is the promise of a slice of NY style pizza that keeps them well behaved while we enjoy our stout. But seriously, this is a fun place to grab a cheap bite – pizza, hot dog or NY deli style sandwich – and a cheap beer, and sit in an area just on the outskirts of the casino floor. The kids feel like they are part of the fun and can experience the crazy live music from a safe distance going on at the Time Square Bar. No, New York New York does not have the best pool or the best kid friendly Vegas shows. What NYNY does have is a down-to-earth and fun party-like atmosphere that we have found to be super family friendly. They have family friendly (and budget friendly) restaurants, a roller coaster and arcade, a park inspired by Central Park with unique attractions, and did I mention they have a fun Irish pub with free live music every night! Well, to me it was worth mentioning again. Walk like an Egyptian! If you love the history of Egypt and the pyramids like I do, then the Luxor is an obvious choice. The desert theme is carried throughout the entire resort, not as much as it used to back in the day (they renovated it in 2007), but it still makes for a very unique family experience in Vegas. The best show for Kids in Vegas. 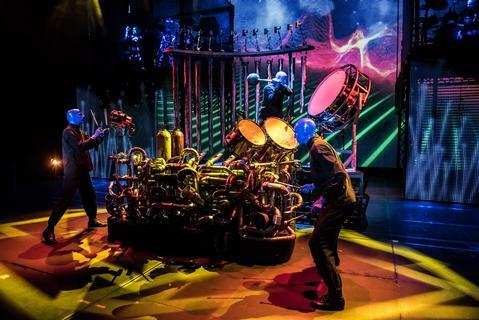 The Blue Man Group Show is an electric mix of high intensity music, lights and visuals that will get the heart pumping and the mind enthralled. Over 35 million people across the world have seen this epic Vegas show, and it is one that every family should experience. It is clearly child friendly because it allows kids 3 and up. It’s less chic and hip. The Luxor was renovated and “modernized” in 2007 to remove some of the emphasis on ancient Egypt and to introduce more modern restaurants and clubs. Still, the Luxor is less chic and lacks the overt luxury of other family friendly Vegas resorts like Mandalay Bay and Venetian. Honestly, though, we personally appreciate the down-to-earth and budget-friendly style of hotels like the Luxor and nearby NYNY. Not the best pool. For us, Mirage and Mandalay have the best Vegas pools for families with kids, the MGM has the best Vegas shows for children, and NYNY has the best Irish Pub with a roller coaster and huge arcade to entertain the kids. 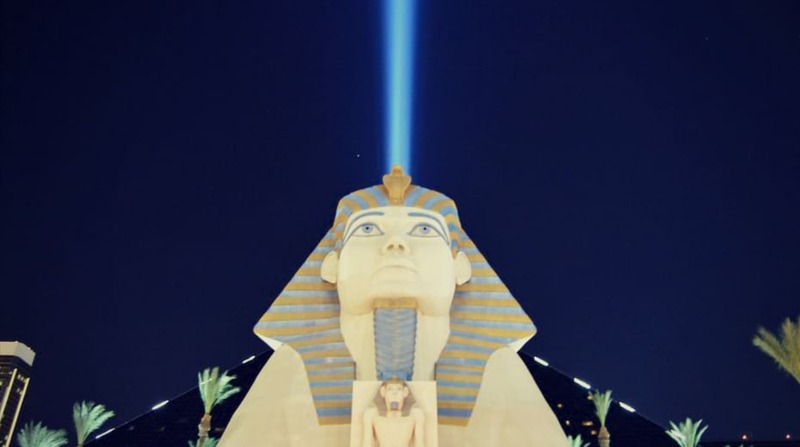 Don’t get me wrong, the Luxor has some awesome attractions for families, but in our opinion, it falls just a tad short in each area in comparison to the competition. (However, the price makes it an extreme value for budget conscious family travelers). The Luxor Pool is the largest in Vegas at over 120,000 sq ft. It has four pool areas with free towels and lounge chairs, and importantly, it also has a beverage service to enjoy Pina Coladas poolside while the kids splash around. For a modest daily fee, you can rent a daybed or cabana for your family. The atmosphere and design is pretty cool, with ancient-looking columns spilling streams of water into the pool and a huge black pyramid persistently greeting you in the backdrop. The Luxor pool is a good family pool in Las Vegas. There are several family friendly Vegas restaurants at Luxor hotel that will likely keep your kids happy and that will quench your adult thirst. Pyramid Cafe: This is a standard Casino restaurant that is open for breakfast and lunch with a classic menu of delicious egg breakfasts with a good burger and sandwich selection at lunch. A no frills place to fill up before an exciting day with your kids in Vegas! We ate their twice for breakfast on our most recent trip and can tell you that the portions are large and the prices are fair, with food that the whole family enjoyed! Open from 7am to 1 or 2pm daily. 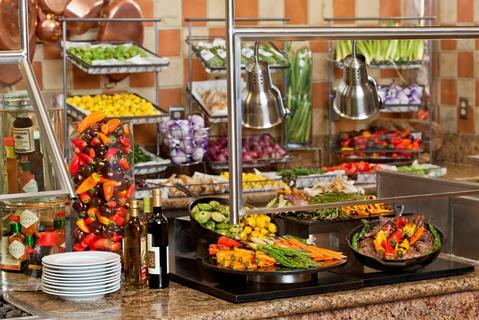 The Buffet: A classic buffet with all of the fixin’s for breakfast, lunch, or dinner. It has an omelette station, decadent desert station, salad bar and hand-carved meat section, and is open from 7am to 10pm daily. Tender Steak and Seafood: Sometimes you just need a steak. You can dress the kids up and try some delicious dry and wet-aged steaks and top-grade seafood. Open daily from 5pm to 9 or 10pm. There are a couple fun places to grab a dinner and a cocktail with kids at the Luxor. However, we recommend if you stay at the Luxor to walk across the street at Tropicana to visit NYNY and also try listening to live music at Nine Fine Irishmen Irish Pub. The Public House: A pretty casual atmosphere with good drinks and comfort food. There is a great selection of craft beers and beers that you will know, and this restaurant is actually modeled after the popular Public House on the East Coast. It has lots of TVs for watching sporting events and killing some dinner time with a good beer or cocktail. Open Monday through Friday from 4pm to 9 or 10pm, and opens earlier at 12pm on the weekends. Diablo’s Cantina: A raucous Mexican food restaurant with homemade salsas, guacamole and various keystone dishes like enchiladas and tacos with a twist, Diablo’s is a great place to dine with older kids if you want to spend an hour or two on the wild side. It’s easy to spot with its bright red neon signs from the lobby or casino floor, and is open daily from 11am to 11pm. 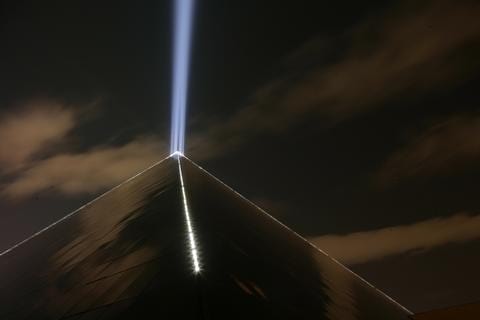 It’s hard to miss the Luxor’s rising pyramid and intense laser beam, but it is also easy to overlook with other “fancier”, newer resorts on the Vegas strip. But it should definitely not be overlooked. At a great value it has the kid friendly Blue Man Group show, an enormous pool, unique and educational museum attractions, and a decent selection of family friendly restaurants and bars. 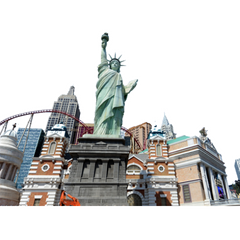 The location is at the southern end of the strip near other family friendly Vegas hotels like Mandalay Bay, NYNY, Excalibur and MGM Grand. 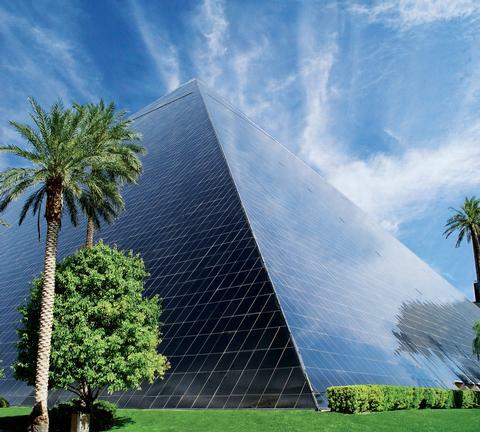 You can stay at Luxor quite affordably and explore this fun section of the Vegas strip for a whole week, and still not get to see it all. There are clearly so many family friendly attractions and things to do in Las Vegas with kids. You can find some of the best restaurants, shows and attractions at each of these resorts on our list of the best family hotels in Las Vegas. So what do you think!? Have you ever taken your kids to Vegas and how did it go? 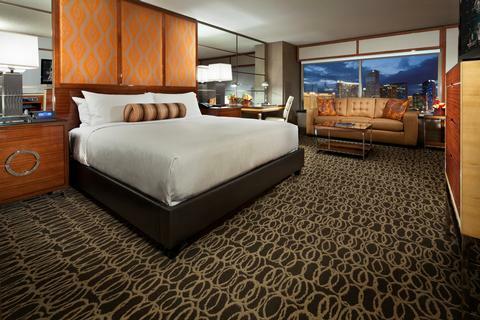 Did we leave any great family Vegas hotels off our list that you would like to add? What did we miss? Love this so much! When I told friends and family that I took my daughter to Vegas years ago, I got some major judgy looks. Vegas is amazing for families. We stayed at the Mirage, saw some live animals (though, yes, animals for entertainment is another issue), and had the BEST time! What a great resource for families visiting Vegas. I’ve stayed at the Mandalay Bay before and the pool area is amazing. 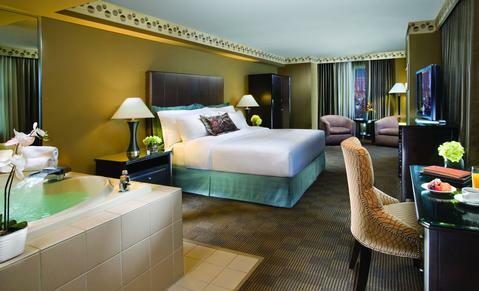 Some excellent coverage of all the best hotels here in Vegas. Having never been, I also love the handy map you’ve created – thanks! 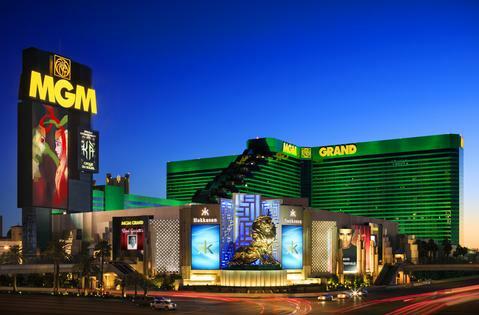 MGM Grand is definitely a great option with its many great shows and the lazy river! Some may think that there isn’t much to do in Vegas with kids, but there are so many fun activities and restaurants to go to. Wow all these hotels come to prove that Vegas has something to offer to anybody of any age! MGM and the Mirage – I never knew they were so family friendly! I’ve stayed at a few of these myself, but I’ve never brought my kids to stay on the strip. But this city is totally built for entertainment, I can definitely see the appeal! Las Vegas has something for everyone and offers such a wide range of choices. The Strip is a must-see at night. Simply walking it is entertainment in itself! What a great list of fascinating places! 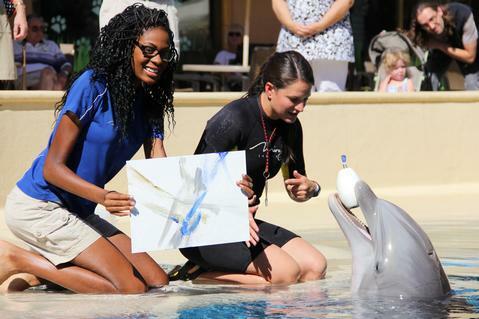 Hope to make my way to LAs Vegas with my kids one day and paint with dolphins! My kids love Las Vegas and all it has to offer. We love staying on the strip! “MGM is also accessible via monorail, which will safely take you all along the Vegas Strip for free.” Everything we can find online says that you have to pay for the monorail? Can you help clarify? Thanks so much, great article! Wow, talk about the ultimate guide. This is great, so much info and very detailed. I love it. Thank you Bob! I always appreciate positive feedback 😉 Please share with your friends and family! Hi, I appreciate you thurough reviews and you content. Its very descriptive and helpful. We are going to take a trip this december and I am having a hard time chosing a resort. My Wife, Mother In Law and my daughter who will be 3 by the time we travel. Can you help me chose a resort that works for 3 year olds. It is dificult because most of the activities I am finding are for 5 and up. Hi Nate (from Wisconsin! ), it is great to hear from you! So since you are a party of four, you have your pick of the litter as most hotels offers standard rooms with 2 queen beds (I assume you will all stay together). When my children were under 5 years old, I remember spending a lot of time at the pool (we stayed at Mirage because it’s our favorite tropical pool in Vegas for families) and also taking them to Seigfried and Roy’s secret garden and dolphin habitat (also at Mirage), so they could see the animals and get splashed by dolphins, etc. 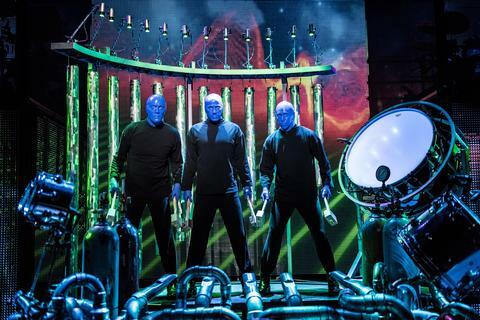 I think a great show to see for a 3 year old would be Blue Man Group (no age restriction), which is located at Luxor. If you went that route instead of Mirage, then Luxor is quite a bit cheaper (say $30/night at Luxor versus $60/night at Mirage) and also has the biggest resort pool on the strip (not as tropical but very nice). 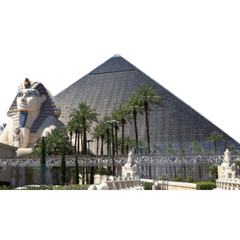 Luxor is also just a free tram ride away from Mandalay Bay, which has a cool shark aquarium, and it is walking distance from NYNY where we like to watch live Irish music at night (you can stay and watch with children as long as you dine there…music starts at 9pm). If you like a pint of Guinness, this is highly recommended! Hope this helps 🙂 Any other Q’s just let me know. Great resource! Vegas is still on my list for a family vacation. Every time I see a new post from you it reminds me, I’ve got to make this happen! Haha that’s how I feel whenever I read a Viking Cruise article from you! Great to hear from a Vegas expert that you can travel there with kids. We fly into Vegas often, although we never stay for more than a night before heading to Arizona to visit family. It’s an overwhelming place, and we have made some very poor hotel choices in the past. 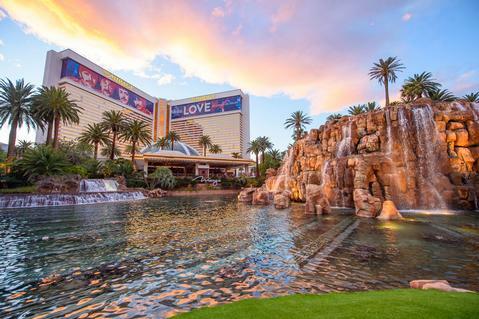 Next time, we’re staying at the Mirage – no question!